Five people have been rescued by fire crews after a blaze in a block of flats in Dundee City centre. 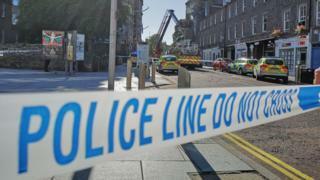 Emergency services were called to the building in the Nethergate, near Dundee Contemporary Arts, shortly after 15:00. Police said two people were taken to hospital suffering from smoke inhalation. The road was closed while five fire crews, along with police and the Scottish Ambulance Service, dealt with the incident.